Plasma TV production ended in 2015. However, many are still being used and sold in the secondary market. As a result, understanding how a Plasma TV works and how it compares to an LCD TV is important. Outward appearances are deceiving when it comes to LCD and Plasma TVs. Plasma and LCD TVs are flat and thin, and also incorporate many of the same operating features. Both offer up the same types of physical connectivity options. Both allow you to watch TV programs, movies, and other content in a variety of screen sizes and resolutions. However, despite their similarities, how they produce and display images is quite different. Plasma TV technology is based loosely on the fluorescent light bulb. The display consists of cells. Within each cell, two glass panels are separated by a narrow gap that includes an insulating layer, address electrode, and display electrode, in which neon-xenon gas is injected and sealed in plasma form during the manufacturing process. When a Plasma TV is in use, the gas is electrically charged at specific intervals. The charged gas then strikes red, green, and blue phosphors, creating an image on the screen. Each group of red, green, and blue phosphors is called a pixel (picture element - the individual red, green, and blue phosphors are referred to as sub-pixels). Since Plasma TV pixels generate their own light, they are referred to as "emissive" displays. Plasma TVs can be made thin. However, even though need for the bulky picture tube and electron beam scanning of those older CRT TVs is not required, Plasma TVs still employ burning phosphors to generate an image. As a result, Plasma TVs suffer from some of the drawbacks of CRT TVs, such as heat generation and possible screen burn-in of static images. LCD TVs use a different technology than plasma to display images. LCD panels are made of two layers of transparent material, which are polarized, and are "glued" together. One of the layers is coated with a special polymer that holds the individual liquid crystals. Current is passed through individual crystals, which allow them to pass or block light to create images. LCD crystals do not produce their own light, so an external light source, such as fluorescent (CCFL/​HCFL) or LEDs are needed for the image created by the LCD to become visible to the viewer. Since 2014, almost all LCD TVs employ LED backlights. Since LCD crystals do not produce their own light, LCD TVs are referred to as "transmissive" displays. 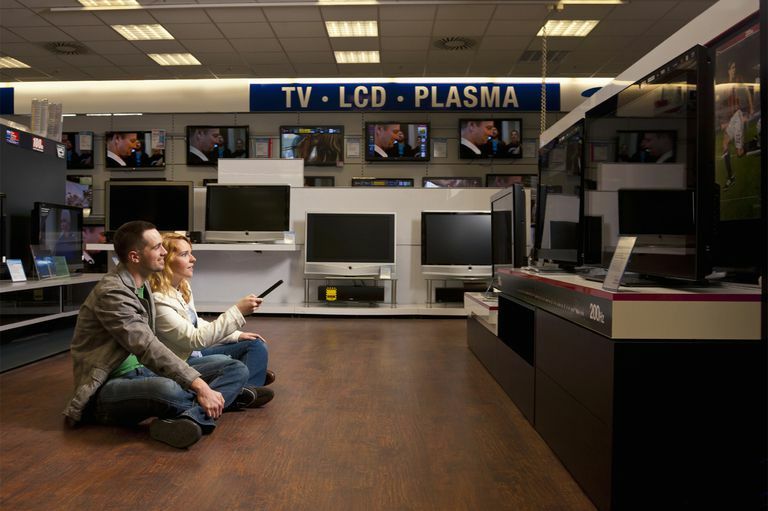 Unlike a Plasma TV, since there are no phosphors that light up, less power is needed for operation and the light source in an LCD TV generates less heat than a Plasma TV. There is no radiation emitted from the screen. Better contrast ratio and ability to display deeper blacks. Better motion tracking (little or no motion lag in fast moving images due to Sub Field Drive Technology). Plasma TVs are not as bright as most LCD TVs. They perform better in a dimly lit or darkened room. The Screen surface is more reflective than most LCD TVs, which means they are susceptible to glare - screen surface reflects ambient light sources. Plasma TVs are more susceptible to burn-in of static images. However, this problem was diminished greatly in recent years as a result of "pixel orbiting" and related technologies. Plasma TVs generate more heat and use more energy than LCD TVs, due to the need to light phosphors to create images. Does not perform as well at higher altitudes. Potentially shorter display lifespan. Early Plasmas had 30,000 hours or 8 hrs of viewing a day for 9 years, which was less than LCD. However, screen lifespan has now improved and 60,000-hour lifespan rating is now common, with some sets rated as high as 100,000 hours, due to technology improvements. No burn-in of static images. No high altitude use issues. Increased image brightness over Plasma, which makes LCD TVs better for viewing in brightly lit rooms. Screen surface on most LCD TVs is less reflective than Plasma TV screen surfaces, making it less susceptible to glare. Lighter weight (when comparing same screen sizes) than Plasma TVs of the same screen size. Longer display life, but the gap has narrowed. For 3D, with LCD you have a choice between units that use Active Shutter and Passive Glasses, whereas 3D Plasma TVs only utilize the Active Shutter Glasses system. Lower real contrast ratio, not as good rendering deep blacks, although the increasing incorporation of ​LED backlighting has narrowed this gap. Not as good at tracking motion (fast moving objects may exhibit lag artifacts). However, this has with the implementation of 120Hz screen refresh rates and 240Hz processing in most LCD sets, but that can result in the "Soap Opera Effect", in which film-based content sources look more like a videotape that film. Narrower effective side-to-side viewing angle than Plasma. On LCD TVs, it is common to notice color fading or color shifting as you move your viewing position further to either side of the center point. Although LCD TVs do not suffer from burn-in susceptibility, it is possible that individual pixels on LCD televisions can burn out, causing small, visible, black or white dots to appear on the screen. Individual pixels cannot be repaired, the whole screen would need to be replaced at that point if the individual pixel burnout becomes annoying to you. LCD TV is typically more expensive than equivalent-sized (and equivalent featured) Plasma TV, although that is no longer a factor, now that Plasma TVs have been discontinued. When 4K Ultra HD TVs were introduced, TV manufacturers made the choice to only make 4K resolution available on LCD TVs, using LED back and edge-lighting, and, in the case of LG and Sony, also incorporating 4K into TVs using OLED technology. Although it is possible to incorporate 4K resolution display capability into a Plasma TV, it is more expensive to do so than on an LCD TV platform, and, with the sales of Plasma TVs declining in recent years, Plasma TV makers made a business decision not to bring consumer-based 4K Ultra HD Plasma TVs to market, which was another factor in their demise. The only 4K Ultra HD Plasma TVs that were/are manufactured are for commercial application use. Plasma has a distinguished place in TV history as the technology that started the trend toward the flat panel, hang-on-the-wall TV, that was promised since the early 1950s. Developed over 50 years ago, its practicality and popularity peaked in the first decade of the 21st century but has now passed on as a result of advancements in LCD TV technology and the introduction of OLED TVs. For a more detailed look at the LCD and Plasma TV comparison, also read: Should I Buy an LCD or Plasma TV?.